George Balazs of the U.S. National Marine Fisheries Service and his dive partner/colleague Denise Parker showed up this week to visit with the Honokowai honu. George had several goals for the first day when Denise was here, several goals for the second day when Denise wasn't, and of course, we had goals for him! We showed George and Denise this summer's "discovery"--a new turtle resting site that we refer to as North House. We pointed out where we hid the temperature logger earlier in the summer so that they could return in January to retrieve it. 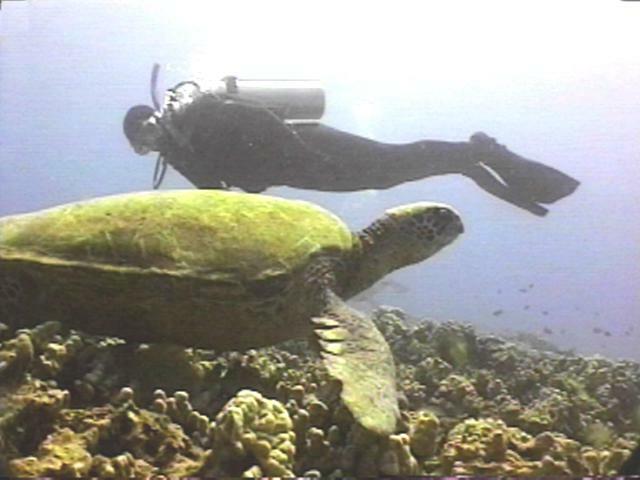 Mainly, though, we did a swimabout so George could assess the FP prevalence in this northern honu "tribe." We did a swimabout so George could assess the FP prevalence in this northern honu "tribe." We then made a swing by the Turtle House, where George and Denise retrieved a logger they'd placed in January and replaced it with a new one. On our way back, George planned to recapture our good friend Polzbarney and bring him to the beach for a full re-examination. The Honlab team had last checked out the youngster in January, and before that, last summer. Even though Polzbarney had been at his usual spot for days before, his ledge was now unoccupied--the word had gotten out! 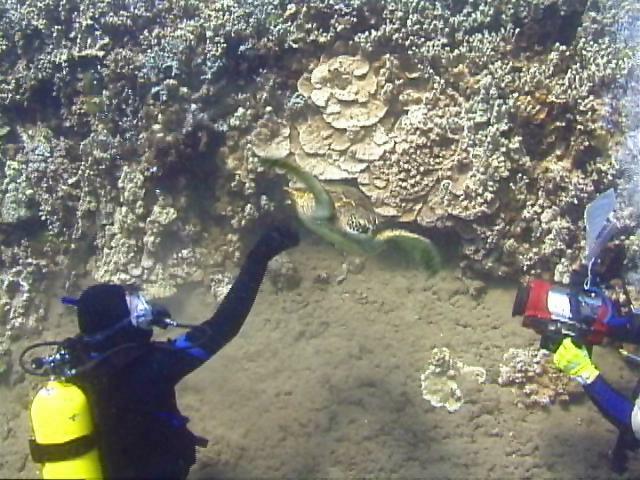 We investigated Reef 2 on our second dive. George hoped to read any other tag but the one we'd already read on Kiholo, the turtle we'd sighted in early July. There was no doubt in George's mind Kiholo was one of the honu he'd tagged on Hawaii's Kona Coast because we shared a video capture of the tag, and it clearly showed the correct letter for a Kiholo Bay honu. Still, algae coating the first digit cast doubt as to whether the number was a 0 or 6. Even though Kiholo had been at his usual spot for days before, he was not there when George needed to see him! Yes, word must have gotten out! Something important and rewarding did happen on the second dive, however. We'd asked George if he would check Makana and confirm our suspicion that she had the very earliest signs of fibropapilloma in her eyes (a whitening in the posterior). Makana was under her ledge and George easily pulled her out. There was little struggle and Makana let George examine both her eyes. There was little struggle and Makana let George examine both her eyes. Then he checked her neck and shoulders. Then her plastron and flippers and feet. Then he stroked her, and let her go. George agreed there is something happening to Makana's eyes. No lump yet that would confirm a tumor--just enough abnormality to cause concern. We've now listed Makana as "FP vulnerable." On our swim back to shore, we prepared to capture Polzbarney if he was about. He was--but he wasn't interested in coming ashore. Despite the efforts of Denise and George, Polzbarney evaded capture and swam off. So that was that. No Kiholo. No Polzbarney. During the time Denise was here we hoped the Honlab team would get a chance to see a hawksbill as well. That didn't happen either. 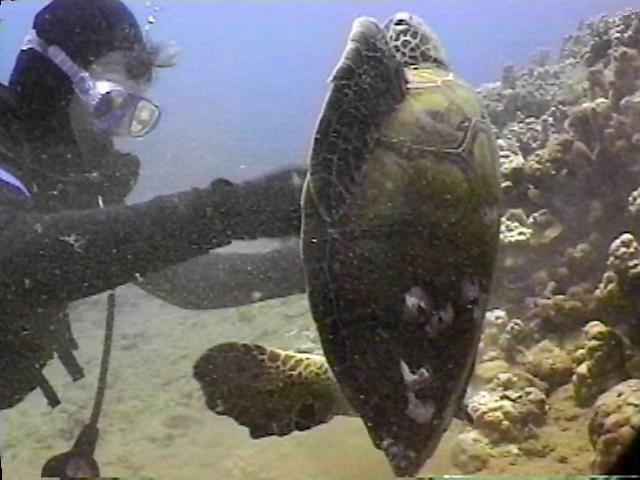 Regrettably, this was the last dive for Denise, since she had to return to Oahu. For Day Two, George had new goals. He wanted to collect samples. Ursula got up early to buy flowers at Safeway to cast into the ocean. If we intend to take from the sea, we must first give. One must observe the proper rites! We try hard to observe the proper rites. The fox is very wise. 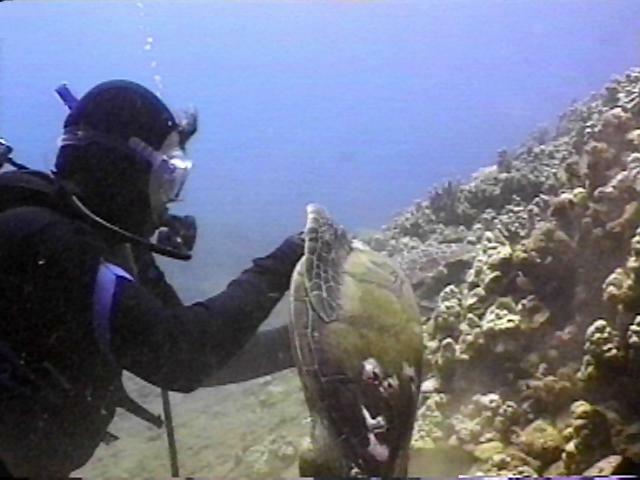 With Denise returned to Oahu four divers now became three. 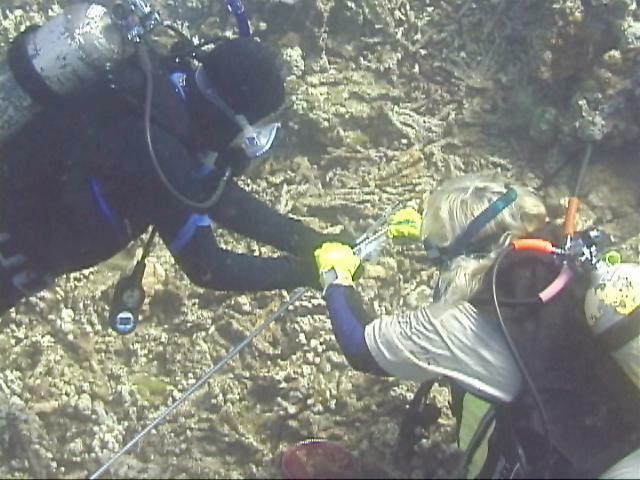 To get all the samples George needed, we decided our best chance of success was a return to Reef 2. Balazs did all the work but Ursula was great opening and closing the sample bags while Peter hovered above babysitting and taking video. Balazs did all the work but Ursula was great opening and closing the sample bags. On our way back to shore, George collected some Cladophora, checked Polzbarney's ledge for no Polzbarney, and that was it for Honokowai. It wasn't all diving and work. In between dives, we relaxed and talked turtle story. The first evening, George treated us to dinner and we talked more turtle story. Driving to Lahaina to exchange tanks, we listened to the Oldies Channel (George listens to the same station we do!) and we talked even more turtle story. We are so fortunate George takes the time he does with us--and that he visits here in January to look in on the Honokowai honu when we can't. The most amusing thing about George's visit happened the day after he was back in his office on Oahu. On our first return to the water minus Balazs, Kiholo was back in his place, and Ake the hawksbill was sitting sweet and true smiling his best. On our afternoon dive, yes, Polzbarney was under his ledge! 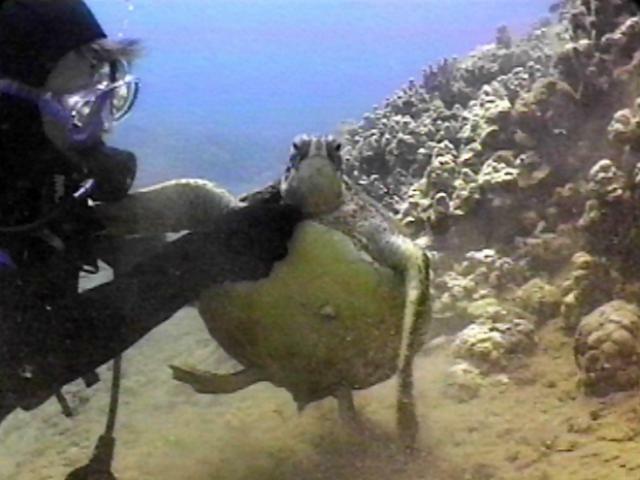 Actually it's a video grab from the first dive after George left. 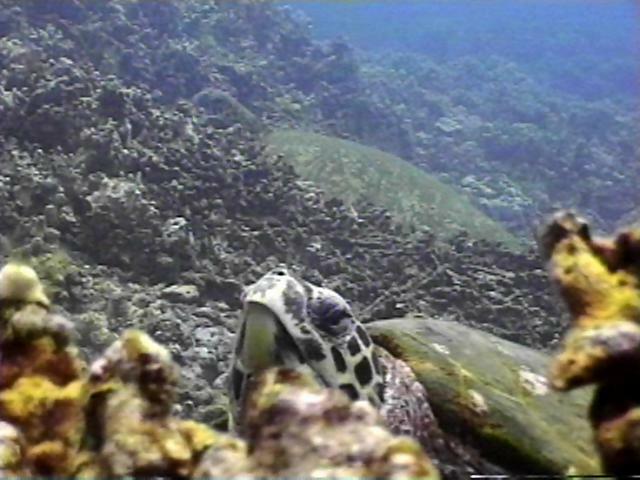 Hawksbill Ake peers over the coral at Zeus' Lair and Kaula (known since 1989) looks on. Hawksbill Ake peers over the coral at Zeus' Lair and Kaula (known since 1989) looks on. Special mahalo nui loa to George Balazs. For everything.